Kathmandu Chitwan Tour is very popular tourist activities in Nepal. Kathmandu valley is a centre of religious place. People come to visit here on faith background. The Pashupatinath Temple, Krishna Mandir Temple and Changunarayan Temple are considered the meaningful place for Hindu devotees while for Swyambhunath Stupa and Boudhanath Stupa are very important sites for the Buddhist (the Buddhism). 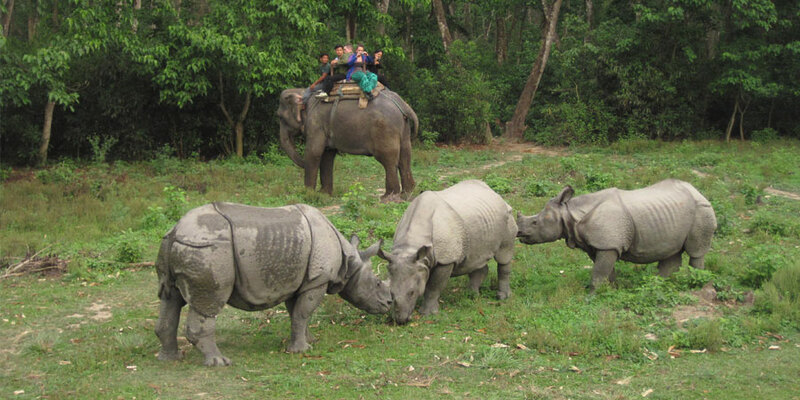 In addition, Chitwan is one of the famous World Heritage site for Jungle safari activities. Furthermore, the meaning of Chitwan is the heart of the jungle. In Chitwan jungle, you can do Such as Elephant back safari , Bird Watching, Canyoning, Nature tour, Jungle walk and jungle drive. Chitwan National park covers 932 square kilometers (360 sq miles) and declares as the world heritage site by UNESCO in 1979. A huge number of travelers come to visit Chitwan national park for jungle safari activities every year. Moreover, Chitwan National Park located in the central Terai lowlands and offers some of the best wildlife – nature sightseeing places in Asia. The Park stakes its eastern border with the Parsa wildlife reserve of Nepal. Besides that, Sauraha Chitwan is a gateway to visit National Park. It is a wonderful place of lush sub-tropical jungles and the home of several animals such as Elephants, Tiger, wild boar, bear, 1 horned rhinoceros including many species of birds and reptiles. So, it is one of the most demanding wildlife safari or jungle safari tour in Nepal. Elephant back riding safari in Chitwan National Park provides an opportunity to get a closer view of the endangered one-horned rhinoceros. Furthermore, you will have to familiarize with the vibrant Tharu lifestyles, their culture, and tradition. Remember us for Chitwan jungle safari tour package in lowest price comparing others. Monsoon season in Nepal. So, it is not a good idea to do jungle safari tours because of tall grasses, so chance to see animals are very less. After refreshments, we can walk a little bit further to get Kathmandu Durbar Square one of the heritage sites in Kathmandu city. Hanuman Dhoka Durbar square is a complex of palaces, courtyards, and temples. They built in between the 12-18th century and are used by Malla kings. An intriguing piece here is the 17th- century stone inscription set into the wall of the palace with writings in 15 languages. The Durbar Square is the social, religious and urban focal point of the city. Day 2 Pre-trip meeting and sightseeing around the Kathmandu valley. Today, your sightseeing trip will start at around 9 am. You will have a private vehicle and a professional tour guide. The sightseeing places we cover today are Swoyambhunath Stupa – The Monkey Temple (World Heritage Site), Pashupatinath Temple (UNESCO World Heritage Site), Bouddhanath Stupa (World Heritage Site), and finally the oldest markets of Nepal, Asan tole in Kathmandu. Day 3 Drive to Chitwan Sauraha. Arrived in Chitwan Villages. Arrival at Sauraha Chitwan and transfer to Hotel. Reception with welcome drinks. Lunch, and Tharu Village excursion, Museum and sun set tour, Dinner. Day 4 Day tour in Chitwan Sauraha ! Chitwan Tours. 6 am wake up call for breakfast, Canoeing, Jungle walk, Visit Elephant breeding center. After Lunch, we go Elephant back ride safari or Jungle drive (optional). Evening at dinner than visit Tharu Cultural show program. Day 5 Drive out to Kathamndu city. Wake up at 6 am. We can walk for bird watching. After breakfast, we drive out to kathamndu city with Tourist Bus.